THIRTEEN’s Great Performances and Pacific Symphony, led by Music Director Carl St.Clair, pay tribute to America’s history with a performance of composer Peter Boyer‘s “Ellis Island: The Dream of America,” a Grammy-nominated contemporary classical work celebrating the historic American immigrant experience. 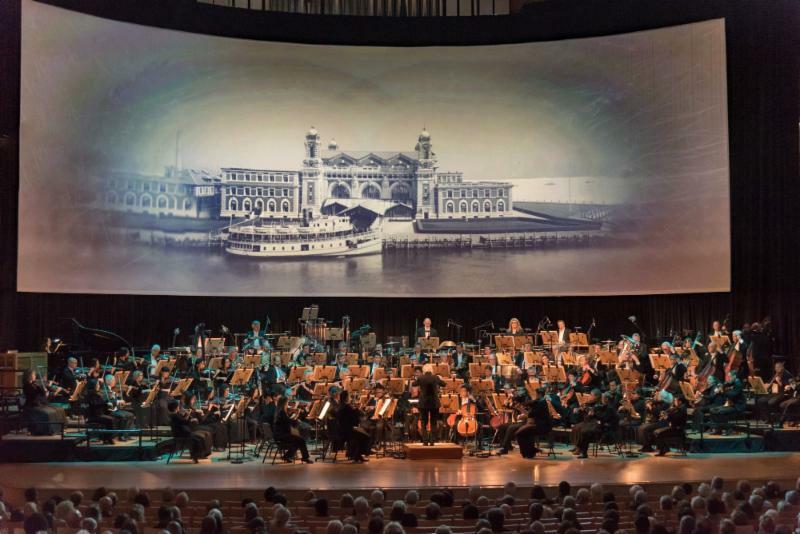 Great Performances – Ellis Island: The Dream of America with Pacific Symphony premieres nationwide Friday, June 29 at 10 p.m. on PBS (check local listings) in honor of Immigrant Heritage Month. It will be available to stream the following day via pbs.org/gperf and PBS apps. Using texts from the Ellis Island Oral History Project and historic Ellis Island images in combination with an original orchestral score, “Ellis Island” features seven, first-hand stories of immigrants dramatically interpreted by guest stars Barry Bostwick, Camryn Manheim, Michael Nouri, Lesley Fera, Lucas Near-Verbrugghe, Samantha Sloyan and Kira Sternbach. Over 40 percent of the U.S. population can trace their ancestry through Ellis Island, and immigration remains at the forefront of global news. Great Performances – Ellis Island captures the emotions, elation and uncertainties of America’s epic immigrant experience. The special was recorded by Great Performances at the Renée and Henry Segerstrom Concert Hall in 2017 during Pacific Symphony’s 17th American Composers Festival. Peter Boyer’s “Ellis Island: The Dream of America” premiered in 2002 to great acclaim. It has since received nearly 200 performances by more than 80 orchestras, and earned a Grammy nomination for Best Classical Contemporary Composition in 2005. A co-production of Pacific Symphony and THIRTEEN Productions LLC for WNET in association with PBS SoCal, Great Performances – Ellis Island: The Dream of America with Pacific Symphony was directed for stage and television by Matthew Diamond and produced by John Walker; with Shawn Murphy as audio producer, production design by Matt Steinbrenner, lighting design by Bob Barnhart and projection design by Perry Freeze. For Great Performances, Bill O’Donnell is series producer and David Horn is executive producer. Major funding for the program is provided by The Ellis Island Honors Society, The Hal and Jeanette Segerstrom Family Foundation, the Jewish Federation and Family Services of Orange County, Nasser and Yvonne Kazeminy, and Seth & Yasuko Siegel and Blossom Siegel. Major funding for Great Performances is provided by the Anna-Maria and Stephen Kellen Arts Fund, The Joseph and Robert Cornell Memorial Foundation, the Irene Diamond Fund, the LuEsther T. Mertz Charitable Trust, The Agnes Varis Trust, The Starr Foundation, the Kate W. Cassidy Foundation, The Philip and Janice Levin Foundation, Ellen and James S. Marcus, The Abra Prentice Foundation and PBS. Great Performances is produced by THIRTEEN Productions LLC for WNET, one of America’s most prolific and respected public media providers. Throughout its more than 40-year history on public television, Great Performances has provided viewers across the country with an unparalleled showcase of the best in all genres of the performing arts, serving as America’s most prestigious and enduring broadcaster of cultural programming. Interested in performing Ellis Island? Request a rental quote here. You can purchase a score here. Visit the Ellis Island page for more information.